Shrinkage limit: The boundary between the semi-solid and solid states. Liquid limit: The water content at which the soil has such a small shear strength that it flows to close a groove of standard width when jarred in a specified manner. Plastic limit: The water content at which the soil begins to crumble when rolled into threads of specified size. The moisture content at which any increase in the moisture content will cause a plastic soil to behave as a liquid. The limit is defined as the moisture content, in percent, required to close a distance of 0.5 inches along the bottom of a groove after 25 blows in a liquid limit device. Liquid Limit (LL or wL) - the water content, in percent, of a soil at the arbitrarily defined boundary between the semi-liquid and plastic states. The moisture content at which any increase in the moisture content will cause a semi-solid soil to become plastic. The limit is defined as the moisture content at which a thread of soil just crumbles when it is carefully rolled out to a diameter of 1/8 inch. Plastic Limit (PL or wP) - the water content, in percent, of a soil at the boundary between the plastic and semi-solid states. It is defined as the property of cohesive soil which posses the ability to undergo changes of shape without rupture or a change in volume. Soil that do not have plastic limit are reported as being non-plastic e.g fairly clean sand, rock dust etc. Non plastic soils make excellent road materials when properly confined under wearing course .e.g. Rock dust. Even when wet they form hard, durable surface whereas clean sand displaces easily under the load. 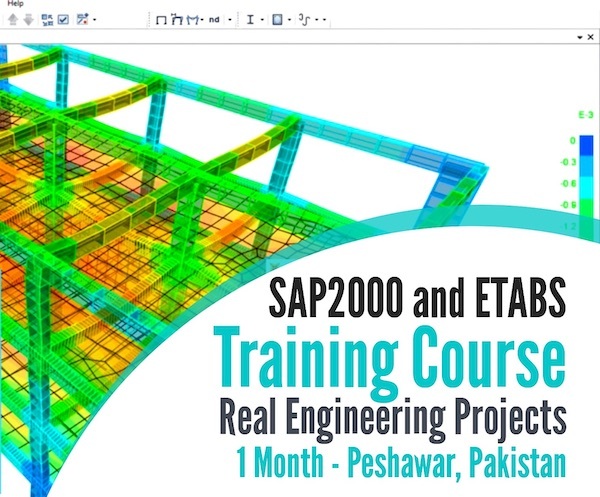 However, their use for base course or for fill brings difficult construction problems. Plasticity Index is the range of water content over which a soil behaves plastically. It indicates the degree of plasticity of the soil. PI is the difference between the liquid limit and the plastic limit. Greater the difference, greater is the plasticity of the soil. Soils with a high PI tend to be predominantly clay, while those with a lower PI tend to be predominantly silt. Soils with high plasticity index are highly compressible. Plasticity index in also a measure of cohesiveness with high value of PI indicating high degree of cohesion. Experience shows that soils with high P.I are much less desirable for sub grade or base course than those having less indexes. For base course common specification is P.I < 3. It is the maximum water content at which a reduction in water content will not cause a decrease in volume of the soil mass. It is the lowest water content at which soil can still be saturated. 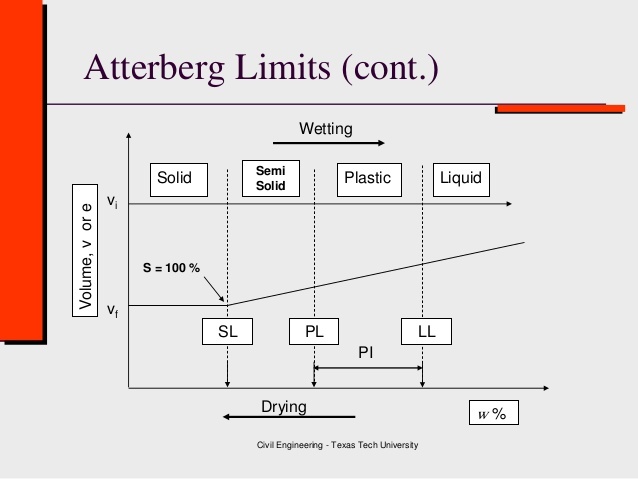 The Atterberg's limits are found for remoulded soil samples. These limits as such do not indicate the consistency of undisturbed soil. The index to indicate consistency of undisturbed soils is called liquidity index of the soil or Water Plasticity Ration of the soil. Its advantage is that The liquidity index (LI) is used for scaling the natural water content of a soil sample to the limits. Where 'If is the slope of flow curve and is termed as "Flow Index"
The shearing strength of clay at plastic limit is a measure of its toughness. It is the ratio of plasticity index to the flow index. It gives us an idea of the shear strength of soil.